This 696 page volume with a handsome linen hardcover is an indispensable guide to the people, places, and history of Garland County. 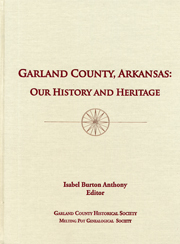 Twenty-one chapters prepared by the Garland County Historical Society cover Garland County’s land, settlement, Civil War era, growth, cultural pursuits, transportation, schools, churches, cemeteries, businesses, government, economy, historic sites, civic groups, recreation, health care, townships and communities, and more. From Memdag to Lonsdale, from the Dark Corner to the National Park, from Native Americans mining novaculite to a future U.S. President playing in the Hot Springs High School Trojan Band, this book offers the only comprehensive picture of our county ever published. Hundreds of family histories collected by the Melting Pot Genealogical Society give fascinating portraits of the people who have made Garland County their home. With over 1,000 photographs and numerous old and new maps, this beautifully prepared book makes a wonderful Christmas gift or addition to your family library or coffee table.